Grant McKenzie doesn’t pull punches, but they’re not thrown without purpose. 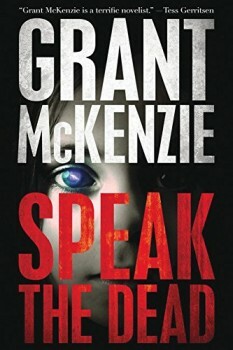 His new thriller, SPEAK THE DEAD, opens with three different people experiencing brutal encounters; splits time between a mortician and a hardened detective; and involves a misguided, bloodthirsty cult, none of which is gratuitous. The book moves at a fast clip, and McKenzie does a terrific job of weaving the tension into the plot; one element is never abandoned in favor of another. McKenzie cut his teeth on five thrillers before SPEAK THE DEAD, as well as the three books in the Dixie Flynn series (under the pen name M. C. Grant) including the Shamus-nominated Beauty with a Bomb. He was kind enough to discuss his new thriller, his craft, and his journey (both the past and what comes next) in the interview below. How did you end up working with Polis Books? Can you describe your path to that publishing house, and the experience of working with them? My publishing journey, like a lot of authors today, has been a rollercoaster ride. I have been published by Random House, Penguin, Heyne in Germany, and others, but always, for some bizarre reason, outside of the U.S. This is especially puzzling as all my novels are rip-roaring, U.S.-based thrillers. Jason Pinter at Polis Books read my novel No Cry for Help—which was published in the U.K. and Germany by Random House—and loved it. He contacted me about U.S. rights and we ended up signing a five-book deal that is bringing one of my most popular books, Switch, to the U.S. for the first time, plus four new novels. Switch was released in trade paperback in August, and SPEAK THE DEAD arrives in hardcover in September. This will be followed by two trade paperbacks, K.A.R.M.A. and The Fear in Her Eyes, in 2016, and a brand new hardcover next September. The relationship with Polis has been wonderful as Jason and the gang truly believe in the nail-biting stories I’m telling, and they really, really want to share them with as wide an audience as possible. I’m excited for a whole new audience of readers to discover what my U.K. and German readers already know: you can’t put these thrillers down. One of the things that’s immediately obvious in SPEAK THE DEAD is the impressive amount of research you must have done. Do you conduct research as you write, or gather the majority of it ahead of time? And do you find that professionals in other fields are open to discussing their craft? There’s an interest in music as your book begins, particularly when we meet Jersey. What forms of art and/or entertainment, outside of writing, do you find inspiring for your work? I always write to music, although it tends to be mostly instrumental: jazz, Icelandic neoclassical, alternative, classical, psychedelic rock, et cetera. But I also love all forms of live performance: dance, theatre, music, burlesque, stand-up, etc. Being a creative person, I was involved in theater, and also dabble in multimedia art. At one point, I actually had a higher income from my art than I did from my writing—not that the bar was set too high, mind you. One of the things I really liked about Jersey Castle is that he’s a somewhat unconventional hero: he’s overweight, out of shape, and not necessarily a gifted fighter, but still charismatic. What drew you to him? I always enjoy creating a character that readers can identify with. My protagonists tend to be regular people who end up in extraordinary circumstances. 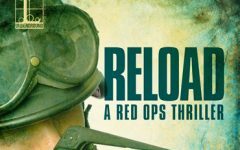 It’s always fun when you can’t pull out, say, Navy Seal training or kung-fu moves, and you really have to think what would I do in this circumstance, which really connects the reader to the character, and makes them genuinely afraid for their safety. Because Jersey is a cop, I had to mitigate his professional training with some normal, everyday obstacles, such as being out of shape and a bit of a soft touch. How did you come up with the (awesome) idea of a gang of motorcycle nuns? The Avenging Angels are a ton of fun to write, and I would love to explore more with them some day. Although the backstory of their vulnerable members is heartbreaking, it’s their strength and determination that makes them so formidable. This is a group that you want to cheer for. Is there anything in writing that you feel is taboo to approach? I believe part of my job as a storyteller (and as a former journalist) is to explore the social justice issues that we face in our society. It can be tricky and some readers do get offended, but I believe it’s important to stand up and say when something isn’t acceptable. My novel K.A.R.M.A. is probably the most divisive of all my novels for this reason. Many readers have called it their favorite novel, while others have been completely shocked. The interesting thing about my writing, however, is that I like to lead the reader to that dark door, but it isn’t the writing that takes them through, it’s their own imaginations. I often get accused of writing things that aren’t actually on the page, but simply in the reader’s mind. Who are some of your favorite writers, past and/or present? I’ve always been a voracious reader with a strong attraction to crime thrillers and mysteries. My first mysteries were Enid Blyton’s Famous Five series, followed by S. E. Hinton’s amazing YA novels, which led into the entire Mickey Spillane library, plus Gregory McDonald, Raymond Chandler, and Dashiel Hammett. From there, it has been a smorgasbord of talented writers from Robert McCammon to John Sandford, Andrew Vachss, Stephen Hunter, James Rollins, Dennis Lehane, Harlan Coben, and sci-fi such as James P. Hogan, Ben Bova and Isaac Asimov, to name a few. My mystery novel Beauty with a Bomb, written under the pen name of M. C. Grant, is a Top 5 finalist for the Shamus Award this year, which is very exciting for me as so many of the writers I admire have either won or been finalists in the past. What advice do you have for aspiring thriller writers? Write with heart. You can have the twistiest, action-packed plot in the world, but what really connects with readers is the breath and soul of your characters. If you’re excited about what comes next, the reader will feel that same energy. I’m excited for 2016 as Polis Books prepares to really make readers sit up and take notice with the launch of three new novels: my intense, dark thriller K.A.R.M.A. ; my heart-wrenching family thriller The Fear in Her Eyes; and a brand new hardcover that will explore three generations of mystery as Ian Quinn, the protagonist of The Fear in Her Eyes, discovers some disturbing truths about his family tree. Jersey Castle will also appear in both The Fear in Her Eyes and the new novel. Grant McKenzie is the internationally published author of four edge-of-your-seat thrillers, plus an ongoing mystery series set in San Francisco. His riveting thrillers The Fear in Her Eyes, Switch, and K.A.R.M.A. are also available from Polis Books. Under the pen name M. C. Grant he writes the Dixie Flynn series that began with Angel With a Bullet, continued with Devil With a Gun, and returns with Baby With a Bomb. His short story “Underbelly” appeared in the First Thrills anthology edited by Lee Child from Tor/Forge. As a journalist, Grant has worked in virtually every area of the newspaper business, from the late-night “Dead Body Beat” at a feisty daily tabloid to senior copy/design editor at two of Canada’s largest broadsheets and editor in chief of Monday magazine. He lives in Victoria, British Columbia. To learn more about Grant, please visit his website.